Hi guys i make this long time ago and i decided to share it but its a beta with many bugs and the FPS are not good ! There are currently no setups for Nihonkai Maze Circuit. Add a Setup. Thanks for reporting the link, it was posted by accident and we've removed it, apologies for any confusion. I wish deletion of the download link of V1.1. V1.1 is a work of umimi2000. These V1.1 is not a work of SmakzZ. Smakzz, maybe it's an idea if it's a beta and you can't really finish the track, to donate its BTB project files to the 'Open Source and Unfinished Projects' thread at Racedepartment.com. Then other people can jump in and (help) finish the track if you lack the time yourself. Thanks for making the Maze though! 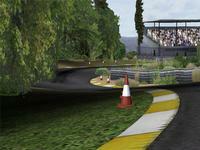 One thing I'd change now is remove those smaller light green trackside bushes - they look rather alien & out of place.